Cycle Chic®: The Boots. They're Back. We offer here irrefutable proof that there is an autumnal feel sneaking into the city. The weather is lovely at the moment and there are still thousands of cyclists wearing their summer flip-flops but the classic Copenhagen boot is reappearing again. 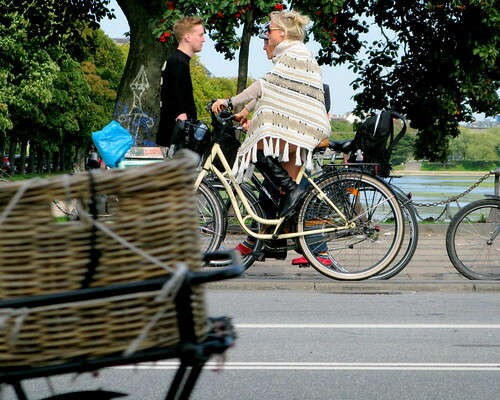 One of the surest signs that Copenhageners are adjusting to cooler times. Above, the boots compliment the short skirt and the poncho. Somewhere in between summer and autumn. It's certainly not cold enough for tights just yet. There must be a name for this in-the-middle period between hot and cool. Late-summer, early autumn... they don't cut it. Any ideas? The Shift Cycle? The gradual shift to warmer clothes? And not all the boots have to been high. And speaking of autumn, here's a great indication that it'll be getting wetter soon. This is from a free magazine called Kiwi, published by a supermarket. It's mostly for women and in the Readers' Tips and Tricks section, a woman sent this tip in. "When it rains I just wrap a thick elastic around my pedal. It helps keep my feet from slipping." Wonderful. In one of the world's wealthiest countries and a nation with proud design traditions all you need is a thick elastic on your pedals when it rains. No fancy, expensive gear. Just be practical and sensible and off you go. Oh, and it works with boots, too. 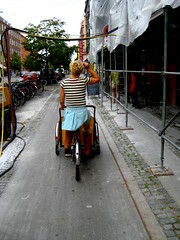 By the way, this blog makes me want to move to Copenhagen - for two reasons - Portland is a bit frumpy for the most part, and you're more likely to see people riding bikes in tank tops and sweatshirts with frayed cut-off jeans than anything - secondly, though a lot of people are starting to ride bikes, they tend to look at it either as a way to be cool, or an athletic pursuit, not simply as transportation. 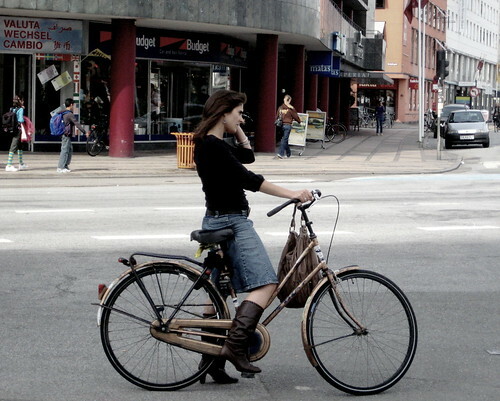 And people driving still tend to just be annoyed that there are bikes on the road. 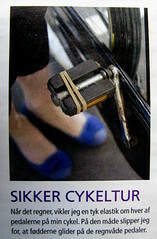 Oh, the rubber band on the pedal is perfect ... and probably just what I need to keep my leather soles from slipping even in good weather. After a hammer, rubber bans are the next best tools. I use them often for different purposes as well as slip proof pedals. I never though of sharing it. But very good point. I am fairly new to your blog. 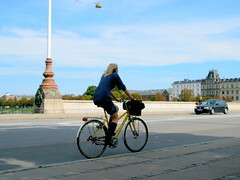 I heard a lot about Copenhagen and was always aware of the biking culture. Although, I think the Chinese have it above you guys. In any case, I now live in the worst city for bicycling. Houston, Texas. Yeah, and I love it. Bicycling is not about the location it is about "S E L F". I agree with "melancholic" statement and it is the same here also. But it is more about how I handle the situation then about the others. It does not matter what city, there will always be something wrong. By the way, I notice a lot of graffiti in the images you have posted of Copenhagen. got Americanized? I am so sorry! Thanks for the comments. The rubber band really sums up how we have demystified the bicycle and have no need for 'gear'. 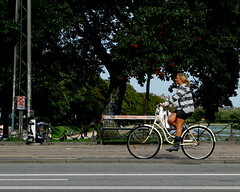 milou, while the Chinese have had a brilliant bike culture, it is changing rapidly, as we posted about on Copenhagenize.com. While I agree with my fellow optimistically melancholic Portlander that Copenhagen does seem like bike paradise (and in fact some of our city planning staff are heading over there and Amsterdam soon for research, I think), I must slightly disagree with MO's opinion of Portland drivers. Although I've encountered a few annoyed/ annoying/ oblivious/ dangerous ones, in the central city and inner east side, where I ride most, drivers frequently yield to me even when they have right of way, and in general I've noticed a bike-friendly attitude. Maybe I've just been lucky so far, and no doubt it's different on the outskirts. I'm also seeing more transportation biking this year, no doubt due to high gas prices. Definitely there's still a high hipster and lycra quotient, but I do think it's changing. I'm contributing by having gotten a dutch bike this summer! I do agree with the frumpy part, though. That's our informal West Coast style here -- casual frumpy, and some of us stylistically challenged riders are proud of our frump! "I think the Chinese have it above you guys" maybe if you favor wearing a gas mask while your outdoors. that's texas for you i guess. I just got back from Copenhagen and almost every woman was wearing boots.